a) To create and disseminate consciousness of research in the field of bioinformatics and system biology through webinars. b) Identify practicable knowledge drivers through a comprehensive look for computational biologists. c) Impart a complete understanding of the principal bioinformatics algorithms and tools through interactive summaries, polls, discussions. d) To provide an online project platform for mentoring graduate students, while bridging the interaction of students in the field of computational biology. e) To cater the need of assimilating existing open source code and developing novel tools and webservers for research community. 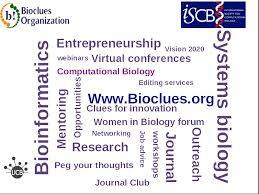 f) To encourage women scientists take up bioinformatics.